Dried elderberries make a delicious and healthful tea. But you can also reconstitute them for use in many recipes, from desserts to baked goods. And while this recipe was developed using elderberries, the muffins are equally scrumptious if dried currants, gooseberries or raisins are used. In fact, any of the dried fruits/berries available in markets would work as well. Just substitute ¾ cup of dried berries in place of the elderberries. Note: you don’t need to reconstitute purchased dried fruits or home-dried currants/gooseberries. We’re also trying to develop a repertoire of gluten-free recipes for garden food events. This recipe uses a combination of oatmeal (rolled oats) and rice flour. 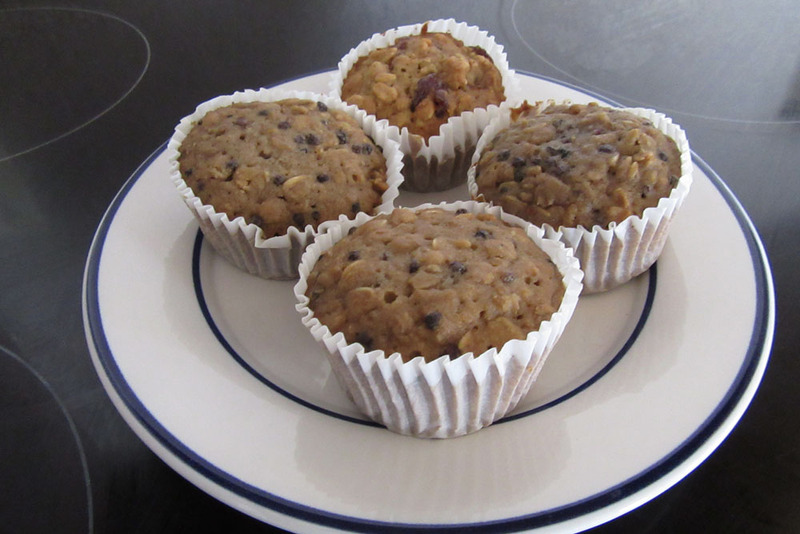 The resulting muffins are light in texture and have the chewy goodness of oatmeal (use the old-fashioned oatmeal for more texture). The muffins smell wonderful baking; like oatmeal-raisin cookies. We think they will please most foodies, including the gluten-free gourmets among us. 1. Place dried elderberries in a heat-proof glass bowl; barely cover with boiling water. Let berries sit for 30 minutes (they will take up water and become softer). 2. Preheat oven to 350°F. (175° C.). Spray a 12-cup standard muffin tin with cooking spray (or line with paper liners). 3. In a large bowl, mix together oats, flour, brown sugar, baking powder, baking soda, cinnamon and salt. 4. In a separate bowl, whisk together egg, milk, oil, and vanilla. Add to oats mixture, stirring until just combined. Gently fold in elderberries (with juice) or raisins/currants. 5. Spoon batter into prepared muffin tin. Bake for 18 to 20 minutes, or until a toothpick inserted in the center comes out clean. Remove to a wire rack. Let muffins sit in tin for 5 minutes; then remove from tin and let cool completely. *You can use dried native currants or gooseberries, or purchased dried berry fruits from the market. You can mix several fruits; or split the batter and make two kinds of muffins. You don’t need to reconstitute purchased dried fruits or home-dried currants/gooseberries. National Pollinator Week (the 3rd week in June each year) celebrates the importance of pollinators for all life on earth. Eighty percent of food crops, as well as many ornamental plants, require insect pollinators. Life without living pollinators would be very different, indeed. By far the largest plant in our Garden of Health is the Catalina island cherry (Prunus ilicifolia ssp. lyonii). 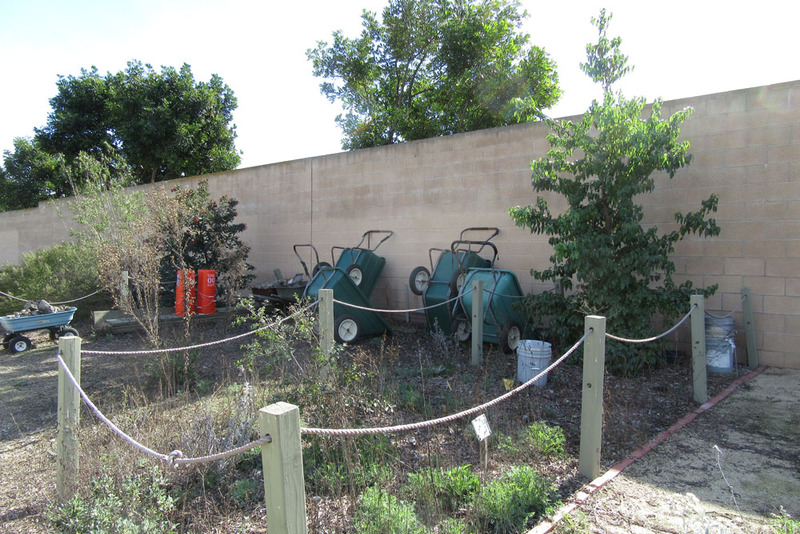 We’ve planted several trees and large shrubs to block the view of our garden cart area while providing medicinals and habitat. The scrub oak and Catalina cherry are finally getting large enough to fulfill that function. Because it’s grown – and because it’s blooming and fruiting right now – we’re featuring Prunus ilicifolia as our plant of the month. The scientific name is pronounced PROO-nus ill-ih-sih-FOE-lee-uh ly-OWN-ee-eye. Prunus ilicifolia is truly the native cherry of western Southern California. Four of the nine California Prunus are native to Los Angeles County. Prunus emarginata (Bitter cherry), P. fasciculata (Desert almond) and P. virginiana (Chokecherry) are all native to the San Gabriel Mountains; only Prunus ilicifolia is native to western Los Angeles County as well. 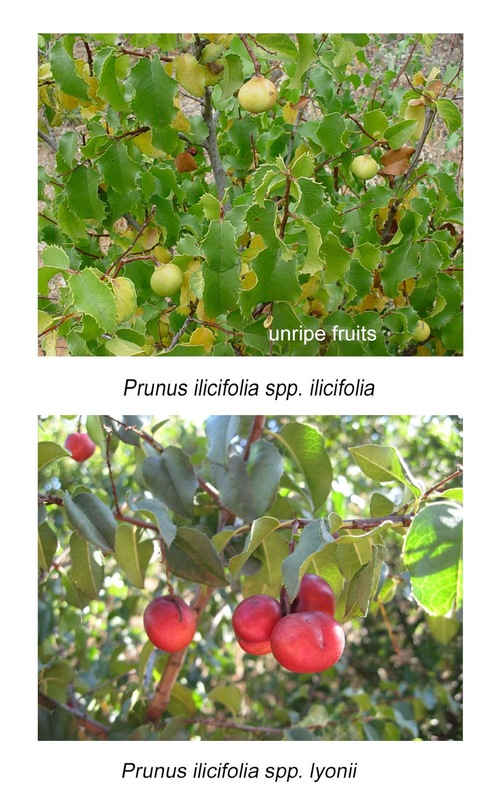 Prunus ilicifolia has two recognized subspecies. The more extensive Prunus ilicifolia ssp. ilicifolia – commonly known as Hollyleaf cherry - is primarily a coastal mainland species, growing from Napa and Marin Counties to Baja California, Mexico. 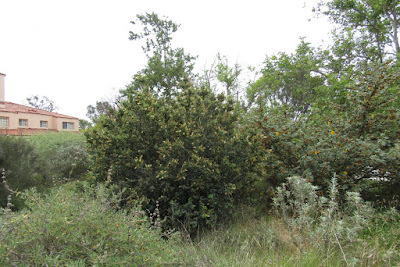 The shrubbier of the two, this subspecies is native to the Santa Monica and San Gabriel Mountain foothills of Los Angeles County. Prunus ilicifolia ssp. 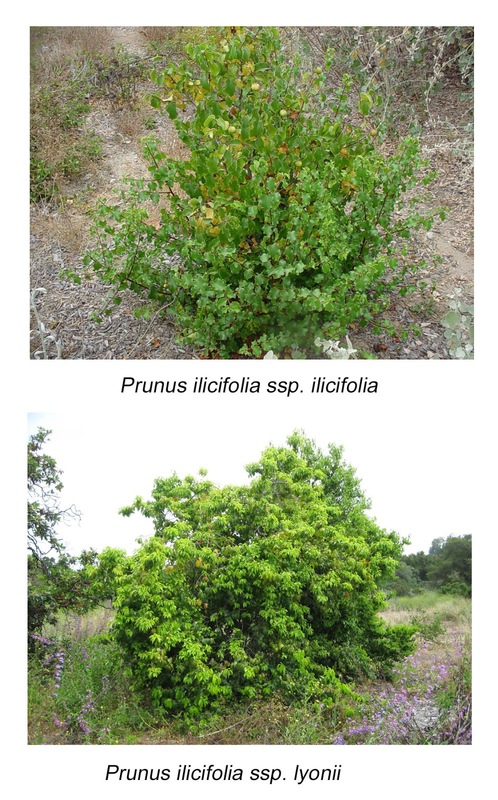 lyonii (sometimes called Prunus lyonii), the more tree-like subspecies, is native to the Channel Islands: it grows naturally on Santa Cruz, Anacapa, Santa Barbara, Santa Catalina and San Clemente Islands. It reportedly also grows on the mainland in Baja California. First collected on Catalina Island by William Scrugham Lyon in 1884 , the Catalina cherry has been extensively planted as a horticultural plant on the mainland, at least since the 1950’s. Thus this sub-species – as well as hybrids between the two sub-species – are not uncommon now on the mainland. Both subspecies grow in moister areas in the drier foothill woodland, chaparral, and coastal scrub communities. They are most often found in canyons, on north-facing slopes or at the base of slopes at elevations up to about 5000 ft. (1600 m.). In general, plants are smaller in drier locations; plants only become tree-like in the moister environs. In the wilds, one can sometimes see the effects of soil moisture differences down a single slope. The Hollyleaf cherry (Prunus ilicifolia ssp. ilicifolia) was planted in the Gardena Willows Wetland Preserve (where our gardens are located) 15-20 years ago, so some nice specimens can be observed there. In our experience (both in garden and preserves), the Hollyleaf cherry is a slow grower, reaching 6-10 feet in perhaps 15-20 years and an ultimate height of as much as 25 or 30 ft. under optimal circumstances. 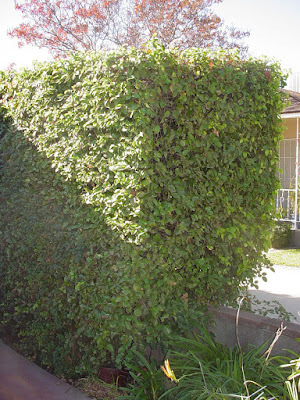 The growth form is dense, rounded and shrub-like, with plants becoming about as wide as they are tall. The plant in the photo about is about 18 years old. In contrast, the Catalina cherry (Prunus ilicifolia ssp. lyonii) grows more quickly to 15-20 ft. tall, gradually becoming broader with age. 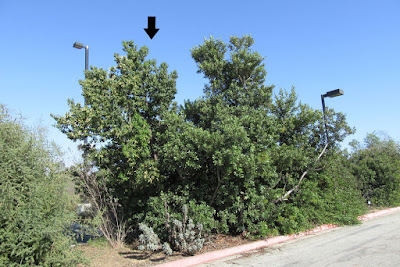 Mature plants are large shrubs or small trees to as much as 25-40 ft. tall and 25-35 ft. wide. 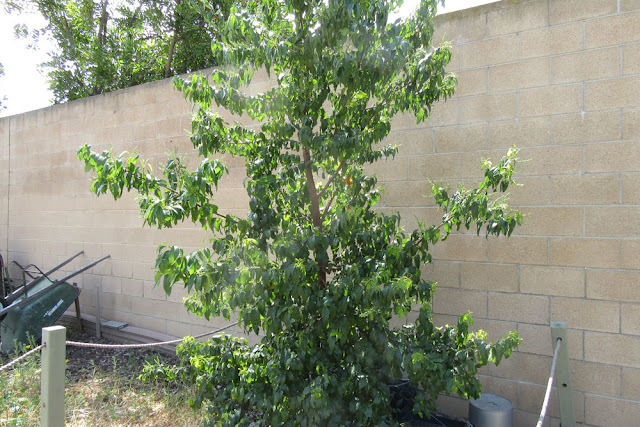 The tree in the photo above is just slightly older than the Hollyleaf cherry pictured for comparison. 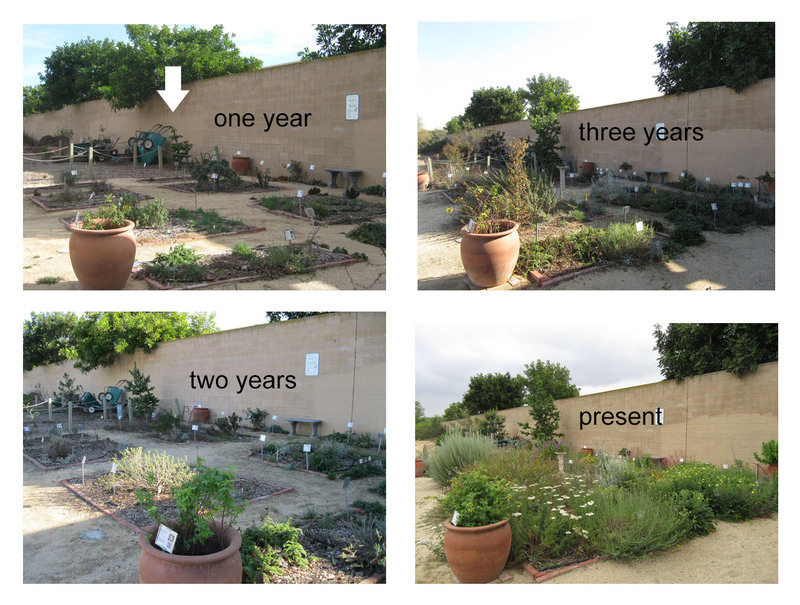 In the photo below, you can see the growth of the tree in our Garden of Health, which is 9-10 ft. tall in 2018 (planted as a 1 gallon plant in 2014). Both sub-species can live to over 100 years in the wild. 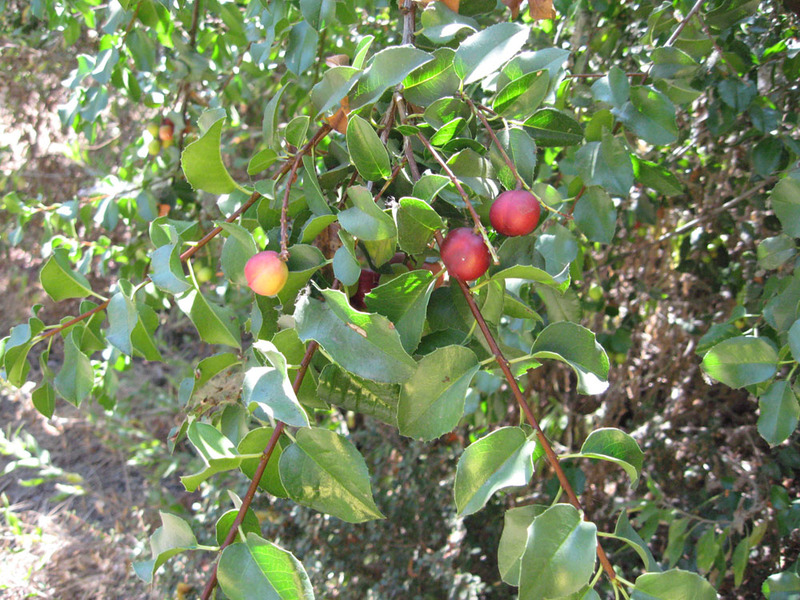 We know of Catalina cherries that were planted in a garden in the 1950’s and are still going strong. The leaves of the two subspecies are quite different. As the common name suggests, Hollyleaf cherry has smaller, evergreen leaves with wavy, prickly edges reminiscent of holly. The color of mature leaves is dark green, with a waxy coating on the upper surface. The leaves are oval or nearly so. 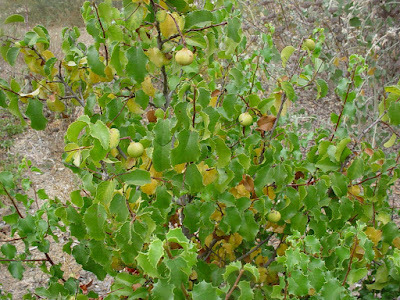 In contrast, the leaves of the Catalina cherry are slightly larger, more elongated (particularly the tip) and have no (or very few small) prickles on their margins (see above). Many plants sold as Catalina cherry in the nursery trade (and some naturally occurring plants) are likely hybrids between the Catalina and Hollyleaf subspecies. 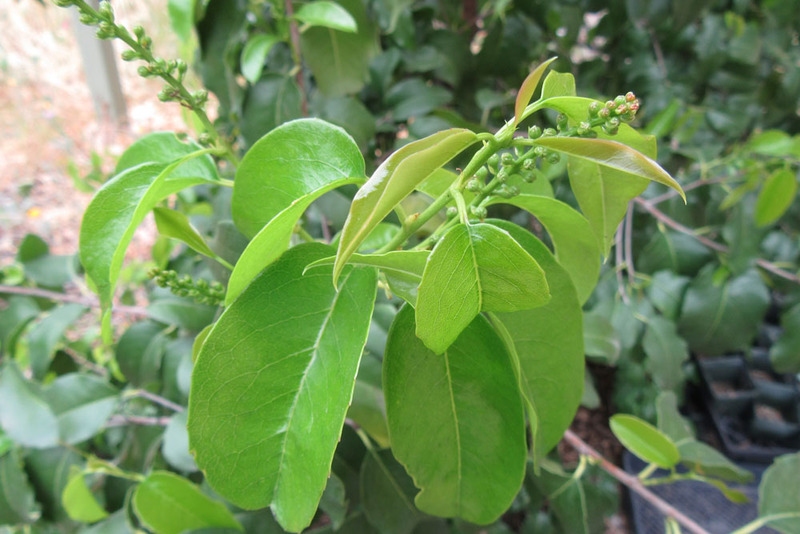 In fact, our plant (see leaves, above) may actually have some Hollyleaf genes – though it behaves and looks almost like a pure Catalina cherry. 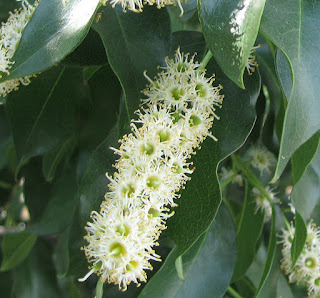 The flowers of both subspecies are typical for Prunus: small, open flowers clustered along drooping flowering stalks. 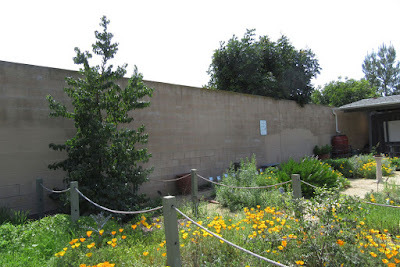 Plants bloom in spring, March to June in western Los Angeles County, and mature plants are covered in blooms. The flowers are white to crème colored, rather simple and open (see above). 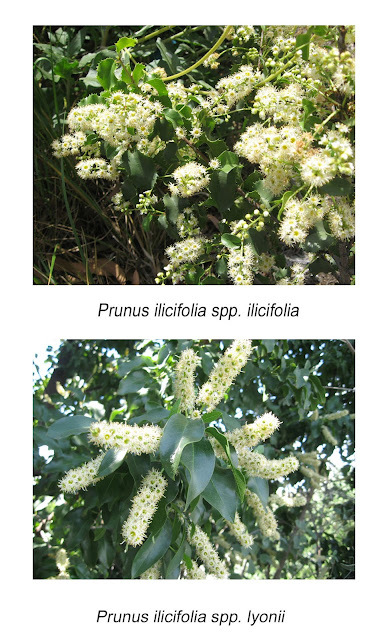 In our experience, the flowering stalk of the Catalina cherry is slightly longer and has more densely-packed flowers compared to the Hollyleaf subspecies (but that may just be the plants we’ve observed). The flowers have a sweet fragrance and attract numerous bees and butterflies. As far as we can tell, the fruits of both subspecies are similar. The fruits begin as small green globes, eventually growing and becoming bright red and then a dark purple red in summer. That’s when they are ready to harvest (see more below). 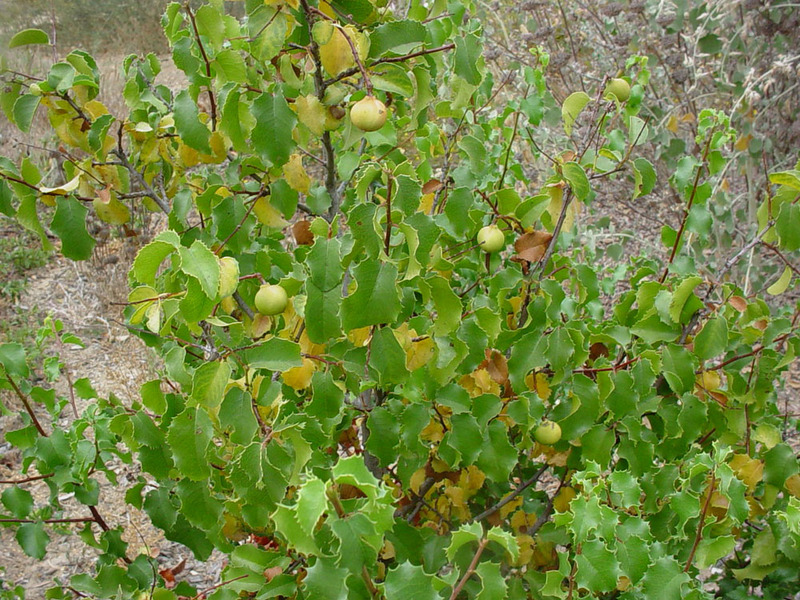 The fruits have a thin, cherry-flavored pulp and a large, hard pit. In our experience, birds love the fruits and can pick an entire tree bare within a few days, leaving only some drying seeds. Fallen fruits will stain concrete – a consideration when situating this plant in a garden. Prunus ilicifolia is a wonderful habitat plant. Starting with the pollinators and ending with the fruit-eating birds, spring and summer are busy times. The plants also attract other insects – and with them, the insect-eating birds. Mature plants provide cover, nest sites and welcome shade for birds. Small creatures hide and rest beneath the foliage. There’s lots to recommend this species as a garden habitat plant. Prunus ilicifolia grows fine in full sun, but really thrives in afternoon shade. It’s not particular about soil texture or pH; just about any local soil is fine. In most settings, monthly deep watering will keep an Evergreen cherry happy. They can get by on less, but will look a bit scruffy over time (most roots are fairly shallow). An established tree may ‘borrow’ water from a neighbor’s well-watered yard. And it can even take regular garden water, if that’s what’s available. Native cherries don’t really need fertilizer, but they’ll take it if given a yearly dose. As to pruning, the choices are many. If your garden style is natural, you may want to let your Evergreen cherry take its own shape. Catalina cherries can be pruned up to make a nice shade tree. Or they can be planted for a natural screen or included in a hedgerow (see below). Plant roots (and leaves?) produce chemicals that discourage weeds and other plants from growing beneath them. 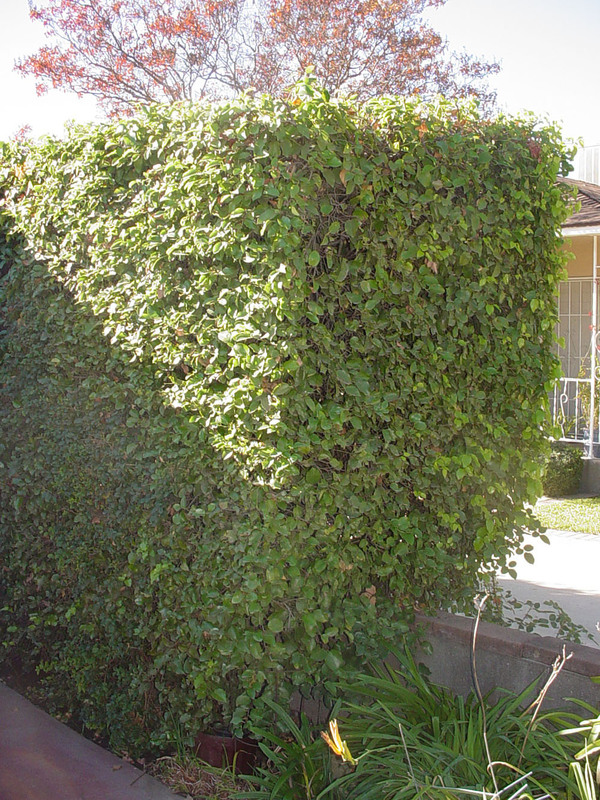 The dense growth habit of both subspecies makes them candidates for hedge-pruning. 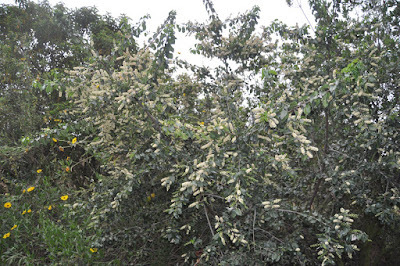 The tall screen of Catalina cherries (above), planted over 60 years ago, has been maintained in a narrow area by twice yearly hedge-shearing. The Hollyleaf cherry makes a nice hedge and can be kept to 6-8 ft. Just remember that plants take a few years to establish. But once they do, you’ll have a long-lasting, elegant native hedge or hedgerow. Prunus ilicifolia is a tough and adaptable plant. It can be used along parkways or driveways, as a transition plant between garden and wildlands, and on slopes. It can be maintained with very little care and is usually disease and pest-free (particularly if allowed to dry out between waterings). This is one of the local native shrub/trees – along with Toyon and Lemonadeberry – that will likely transition well into the gardens of the future. The fruits of Prunus ilicifolia can be prepared and eaten – but must be prepared properly. The thin pulp tastes like bitter cherry and can fermented to make an alcoholic beverage. We’d love to try making a liqueur with the pulp. The pulp can also be combined with lemon juice to make a tart condiment. The kernels of Islay were a dietary staple for some California natives. The pulp is first removed and the hard pits completely dried. The pits are then cracked and the kernel removed. The kernels must then be leached in several changes of warm water to remove the toxic cyanide and other chemicals. After leaching, traditional cooks either cooked whole kernals until soft or ground them into a paste. This was either cooked for mush or made into a tortilla-like flatbread that was ‘baked’ on a flat griddle. It was also often parched and used to make pinole. For more on preparing Islay for food see references 2 and 3, below. Prunus ilicifolia also has a history of use as a medicinal plant. Once again, caution must be exercised when using any part of this plant as a medicinal. Prunus species produce many chemicals dangerous to humans – even in small amounts. All members of the genus contain amygdalin and prunasin, substances which break down in water to form hydrocyanic acid (cyanide). A tea made from the bark (spring/summer) or roots (winter) was traditionally used to treat coughs and colds. We suggest that there are safer alternatives to treat such complaints! 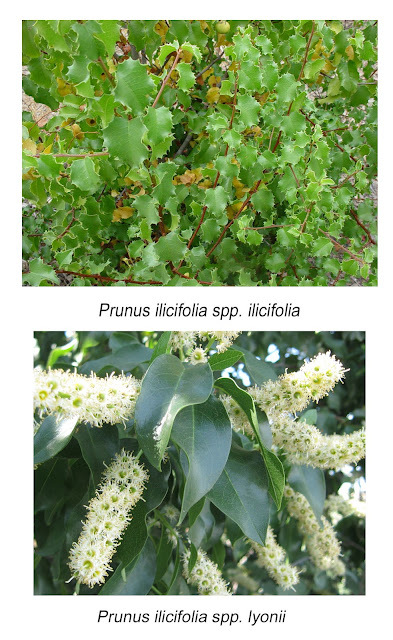 In summary, Prunus ilicifolia is a wonderful native shrub/tree. There is much to recommend the use of both the Hollyleaf and Catalina island subspecies in local gardens. The only limitation would be for persons gardening within ¼ mile of native preserves of this species (e.g., within pollinator range). In this case, the responsible gardener should either plant specimens raised from local natural seeds – or plant an alternative species altogether. These days, many gardeners are looking for evergreen shrubs and trees to provide more shade and green foliage in their gardens. 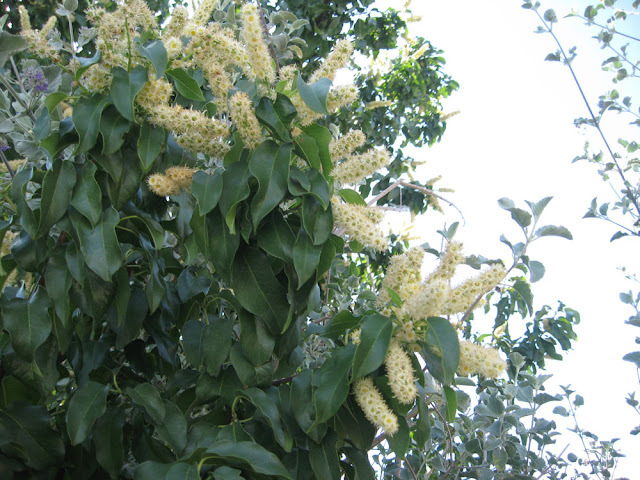 Prunus ilicifolia provides a native alternative that is pretty, easy-to-grow, water-wise and a great habitat plant. We’ve lived with this species for many years, on many sites, and cannot recommend it too highly!